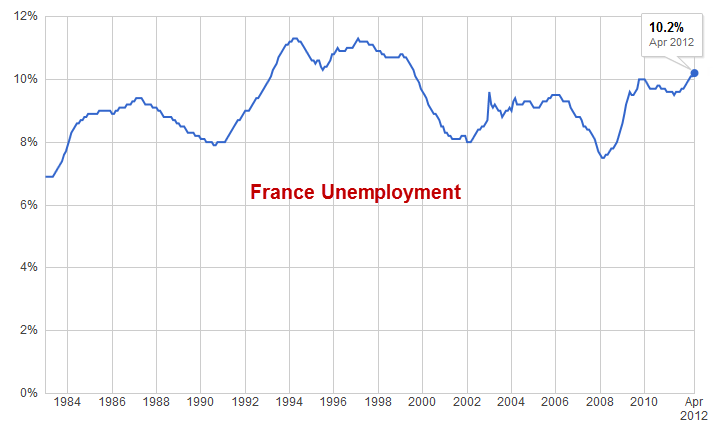 Mish's Global Economic Trend Analysis: Hollande About to Wreck France With Economically Insane Proposal: "Make Layoffs So Expensive For Companies That It's Not Worth It"
Hollande About to Wreck France With Economically Insane Proposal: "Make Layoffs So Expensive For Companies That It's Not Worth It"
Unemployment in France touched 10.2% in April, a number last seen in 1999 according to data from Eurostat. The question on newly-elected President Francois Hollande's mind is what to do about it. Hollande's layoff clampdown solution according to Labour Minister Michel Sapin is to "make layoffs so expensive for companies that it's not worth it." France's new Socialist government is planning to ramp up the cost of laying off workers for companies in the coming months, its labour minister said on Thursday after data showed the jobless rate hit the highest level this century at 10 percent. "The main idea is to make layoffs so expensive for companies that it's not worth it," Sapin said in an interview with France Info radio. "It's not a question of sanctions, but workers have to have compensation at the right level," he said. Industry Minister Arnaud Montebourg is also planning legislation that would force companies to sell plants they want to get rid of at market prices to avoid closures and job losses. Mass layoffs will occur before the law passes. Companies will move any jobs they can overseas. Ongoing, if it's difficult to fire people, companies will not hire them in the first place. Corporate profits will collapse along with the stock market should the need to fire people arise. The proposal to force companies to sell plants rather than fire workers as outlined by Industry Minister Arnaud Montebourg and Labour Minister Michel Sapin is nothing short of economic insanity. Think the Nannycrats in Brussels will go for this idea? If they do, they will wreck all of Europe. If they don't, then how are they going to "harmonize" everything? Also see my original post on the "nannyzone" written June 2, 2011, nearly one year ago today: Trichet Calls for Creation of European "Nanny-State" and Fiscal "Nanny-Zone"
Point 3 is the biggest but it gets even more insidious. The companies that have enough employees now are generally larger companies with a political voice. The companies that will need employees later are generally smaller, entrepreneurial companies with no political voice. Since most job creation happens at the entrepreneurial level, the proposed policy will subsidize corporate stagnation while stemming the flow of entrepreneurial companies entering the market. Over the long haul, this will kill France's economic competitiveness while increasing unemployment. Recall government enforced jobs in the former USSR in the 1980's. How well did that go? Things got got so bad the USSR had to dissolve.